Richard Lainhart was one of the seminal figures in contemporary American electronic music, composing more than 150 works over the course of nearly four decades. His distinctive sound was characterized by organic textures inspired by natural phenomena, such as clouds, water and fire, typically arranged in minimalist structures and treated with microscopically observed harmonies. These explorations dated to the early 1970s and pre-figured the electronica, ambient, trance and other sound art movements that would eventually celebrate him as an aesthetic figurehead. Uncommon to the genre, Lainhart was also a prolific performer as well as composer, continually expanding the boundaries of human-machine interaction and expression through a myriad of customized hardware and software technologies, often through their formative stages of development. 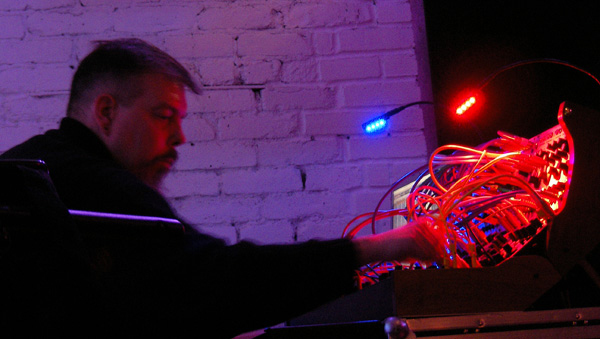 In recent years, Lainhart returned to the modular, analog synthesizer technologies of his early interests, and became a noted tutor and instructor for a generation of young electronic musicians attracted to the resurgence of these vintage sound producing techniques. Lainhart's work was performed in the US, England, Sweden, Germany, Australia, Italy and Japan, and recordings of his music have appeared on the Periodic Music, Vacant Lot, XI Records, ExOvo, Airglow and Periphery music labels. Originally from Vestal, NY, Lainhart earned his degree in music from the State University at New York at Albany, where he studied composition and electronic music with composer Joel Chadabe. Besides his own works, he worked and performed with such new music luminaries as John Cage, David Tudor, Steve Reich, Phill Niblock, Rhys Chatham and Jordan Rudess, among many others. In addition to his music, Lainhart's animations and short films premiered at digital festivals throughout the world. His film "A Haiku Setting" won several awards at the 2002 International Festival of Cinema and Technology in Toronto. In 2009, he was awarded a grant by the New York State Council on the Arts for "No Other Time," a full-length intermedia performance designed for a large reverberant space. In 2010, he was a featured media artist at Netmage in Bologna, Italy, and his year-long timescape film "One Year" was awarded Best Experimental Film at HDFEST in Portland, OR. Richard Lainhart, an inexhaustible composer, filmmaker and teacher whose works inspired multiple generations of electronic musicians and digital media artists throughout the world, passed away on December 30 near his home in New City, NY. He was 58. Electronic Musician and Keyboard Magazine publish Ron Goldberg's tribute to RIchard. Memorial photo essay from Jim Goodin on YouTube. A bittersweet photo essay of Richard's memorial from Tom DeWitt. "Fourth Shore" — by Swedish composter Fredrik Johansson and dedicated to Richard. Fredrik remembers Richard as a friend and mentor. [EL014] Richard Lainhart – Introduction to Analog Synthesis — Shane Morris has posted Richard's 2010 seminar on analog systhesis at Pocono Skies festival to Etheral Live – a netlabel for live ambient music. He has written an excellent introduction to Richard's lecture. >> Read Richard's second interview with Tokafi, focusing on his collaboration with Jordan Rudess. >> Listen to KALW Radio interview Richard about his music. >> Richard answers the question "Why do you use unconventional techniques?"